The plank is a strengthening exercise that uses the abdominal muscles to hold the body in a face down bridge position, while maintaining a flat back. Strength gains in the plank directly translate to improvements across a wide spectrum of other exercises from Push Ups to overhead presses. Having a strong connection between hips and shoulders allows for more efficient movements and power transfer to the limbs, reduced risk of injury and pain, especially involving the lower back. It doesn't hurt to know that a stronger corset of core muscles can help drop a belt size or two just from holding everything where it should be. Weaker corsets can be pushed out by intestinal pressures increasing girth and bringing with it a host of potential health concerns and chronic back pain. How do you perform a plank ? Lie flat on your stomach, place forearms on ground with elbows directly under shoulders, raise body off ground and maintain a straight back, head in line with spine and eyes focused on a point on the ground just in front of your hands. The fine points.... How to really get it right. Join hands together and press gently into the ground to spread the load away from elbows. Engage your lats by pulling your shoulders toward your hips. Tighten the abdominal and core muscles. Engage the muscles you feel contracting each time you cough. A cruder but far more effective explanation.... try cutting of your urine mid flow..... these are the muscles you want engaged while you plank, for the entire duration of the plank. Once these muscles fatigue and fail, your plank is over. Do not allow other body parts, especially the lower back, to pick up the slack. It is this group of muscles that we are trying to strengthen over the next 30 days. Looking up, causes excess curvature of the spine, pinching lumber vertebra and pushing hips towards floor. Fix this by keeping your eyes focused in a set point near hands. Chin down, in neutral position, head in line with spine allowing for the best activation of the abdominals, and glutes, providing best support for the back. Head, Neck & Spine in line. Holding breathe or shallow breathing near the end. Even with perfect body alignment, it is possible that the the corset muscles could relax. When this happens the hips slowly drop but the lower back muscles take over and are used to keep hips in line. At this point you are no longer holding your plank, so tighten up or drop. Increases in your timed plank are worthless and possibly dangerous if not done correctly. Forearm Plank (as described above) For Time. Simply hold good form for as long as possible. Quality is the win today!. Share your stopwatch screen shot and experience in the comments below. You may never know just who you are inspiring. Shin Splints: all you need to know. Media Tibial Stress Syndrome if you want to impress your doctor with your self diagnosis. Or simply pain in the lower leg, typically front or toward the inside of the shin. This pain is often caused by tiny micro tears in the muscles surrounding the shin bone, or Tibia. Often associated with running, Shin Splints are more often than not caused by increasing the mileage too fast, and not giving the legs time to adapt to this new pounding exercise. Another common cause is over pronating (rolling) the foot. This can be due to your own biomechanics or by the terrain you choose to run on. If you have no choice but to run on roads, then try to avoid the edges that slope downward from the centerline of the road. This also applies to beaches with steep drop offs toward the water. The flatter the surface from side to side, the better. If your feet are landing on a surface that slopes sideways it will cause you to roll your foot more than it is used to. Continue this for some distance and you are inviting trouble. On quieter roads, if possible, run along the flatter centerline until you are forced to move over for traffic. (not advisable if you can't run without your headphones!). If the roads are too busy for this then switch sides often to balance out the sloping edges before any one side becomes too stressed. Running is one of the cheapest entry level sports out there. You do not need much equipment to do it and most people already have everything they need before they decide to try it. Even so, it is worth investing in a good pair of footwear. Old, dead soles are the next biggest cause of Shin Splints so it's worth it if you replace them regularly. Most studies show that the most expensive pairs do not equate to better performance or reduced injury rates. Find a pair that works for you, and replace them often. The more you use them the more often you should replace them. The harsher the surface you train on, the more often you should replace them. Tightness in shin, can fade or become an aching pain as exercise continues. Shins can be painful to touch. Pain is often in lower 2 thirds of shin or Tibia, and can often extend right down toward inner ankle. In mild cases, pain and discomfort fade as inflammation subsides, after training. If early symptoms are ignored and training persists, severity of the pain can occur and in this case may not fade after training is finished. Some redness, swelling and puffiness may occur along the shin bone. If continually ignored and not given adequate recovery or treatment, shin splints may become Stress Fractures. Avoiding them in the first place is always the best option. Failing that, pay attention to the early warning signs, reduce the amount of stresses you place on the legs and increase recovery times between training. Unlike most other overuse or repetitive strain injuries, the muscles of the shins are very difficult to rest adequately once injured. Ignoring the early signs and pushing through the pain is not recommended. For new and enthusiastic runners, refrain from increasing your weekly mileage by more than 10%. Take extra recovery days at first signs of pain. If prone to recurring episodes of Shin pain, even after adding strength and conditioning to your training, then the cause may be more complicated, possibly down to biomechanics of foot and lower leg, causing over probation of the foot while running/training. If this is the case it is always a good idea to get a specialist to check it out and advise corrective treatments such as orthotics or particular training sneakers. Comment below with any questions or useful tips you may have. Or drop in to #DamienRocheFitness for more tips and strength and conditioning advice. Senior Fitness: Are these exercises right for you ? This is a good read if you are interested in looking for info on seniors beginning to exercise. As with all ages and fitness levels, it is worth noting that it's often more a case of individuals having restrictions than any one exercise being 'bad' for everyone. We get to work often with seniors of all fitness levels, from post op and physical therapy graduates to more than a few that inspire and motivate everyone in the classes, including our instructors, to keep active and keep young in heart body and soul. Everyone has their own entry level. If you have any concerns, about where that entry point may be or if there's a valid reason for avoiding certain exercises the best place to start is with a conversation with an experienced trainer who can offer advice, modifications and peace of mind as you commit to being as young as possible for as long as possible. It doesn't even need to be physical. But ask yourself what it is that you want. Then figure out WHY you really want it. Your WHY, will keep you on track long after the initial momentum fades. Then choose to do one action today, or even to eliminate one action today, to help your tomorrow be a step closer to Your Goal. It can be overwhelming, but it doesn't need to be. The good decisions each day are the wins. The progress reports along the way are the wins. Don't place all the success on accomplishing your goal. Celebrate each win along the way. Everybody needs and benefits from help. Your mentors and icons have all asked and received help. They still need help. Don't Not ask. Our team at #DamienRocheFitness can certainly help you clarify what you want and how to make steps toward getting the results you want. Or reach out to anyone who has inspired you. They may love to know that you are motivated to improve because of them. Decide to take charge today, as it hasn't happened by accident yet and probably won't at this stage. The seventh day of The Damien Roche Christmas Workouts looks like this, a three part workout. Repeat Part 2, only beat your time. After your warm up and stretching, start a timer and race through these exercises. As soon as you finish your last rep of the 2nd round stop the timer and record your result. Rest as needed but do not stop the clock until you are finished. Your result will include any rest time taken. Take 2 min active recovery/rest before starting part 2. Part 2 : Set your timer for 5 minutes. 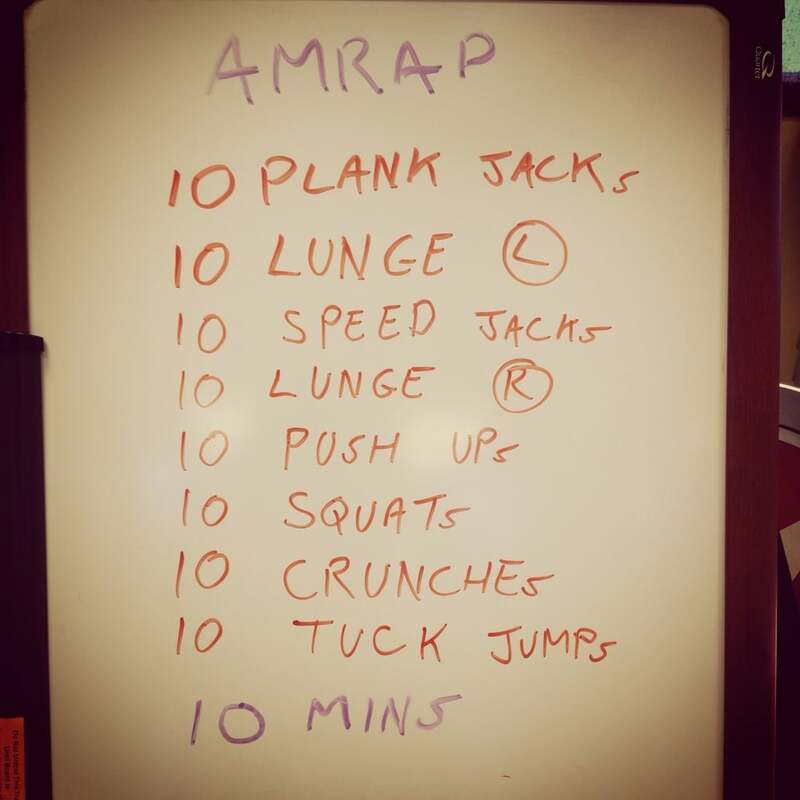 You aim is to repeat 5 of each exercise in sequence and repeat as often as possible in the 5 mins. Note your round and the exercise rep you finished on when the time runs out, as you can use this as a mark of your current fitness. Repeat in 4 - 6 weeks and crush this today's result. Take 2 min active recovery. Repeat Part 1 again, with the goal of matching or beating the 1st time. Post your times in comments below, add some of your own photos or screen shots if you like. Lie on your back, finger tips touch temples, pull left knee in towards chest while sending right foot out long and about 6" from the floor, roll right shoulder off the floor towards your left knee, then slowly switch sides, rolling both shoulders flat to the floor before raising the left shoulder to meet the right knee. That's one pair. Commit to these short but effective workouts and begin to feel and see results in just 12 Days. As always.... you know your own body. Stretch, hydrate and challenge yourself accordingly. Day 1 of a 12 Day series of short, challenging and effective workouts. Increased energy levels throughout the day. Improved sleep quality and duration. Functional strength gains for daily living. Increased endurance for sustained activities from yard work to traveling. Ease the symptoms and even reverse the effects of long term illnesses such as Diabetes, Heart Disease, High Blood Pressure, and even some forms of Arthritis. Reduced risk of falling due to improved balance, reaction and coordination. Improved chances of coming away from a fall injury free or with less serious complications. This list can go on and on so basically exercising can make you feel great and offer you a more independent lifestyle for longer. It can also be fun, especially if you exercise with some like minded friends or as part of a class such as SilverSneakers®. I have never exercised before. Is it too late to start now? There are very few people over the age of 65 that would not benefit from some form of increased activity, even those with chronic disease. The key is to find the right activity and the right intensity. It is always advisable to get your doctors clearance and to ask for advice or take a class with a certified experienced trainer. Choosing to begin is always a tough decision. It can be discouraging having limitations set by an illness or finding yourself gasping for breath after moving from couch to kitchen or up the stairs. When we do not know where to begin it is easier convince ourselves that it is probably not the best idea for me at this time. A good place to start is to find some comfortable clothing to wear. It doesn't need to be expensive or sports wear but it should be easy to move in, non restricting and not get too warm midway through exercise. Layers are a great way of maintaining comfort, zipping down and peeling off as the warm up moves into main workout and then putting them back on for the cool down and post workout. Footwear is perhaps the most important item required. They should fit correctly and offer good support, and cushioning. Comfort is important, as is a snug fit so the foot is not sliding around inside, and not too tight at any point, both of which will result in blisters. Next is to choose exercises appropriate to your fitness and activity levels. Exercise is an increased workload on the body. If this work load is increased gradually, the body responds by adapting, getting stronger and better able to perform that workload. Once the work becomes easier it is time to challenge the muscles with another increase in the workload. If you are currently inactive this workload may be repeating a slow sit down in to a chair, or taking a stairs instead of an escalator, gradually increasing the distance that you park your car from where you need to go. If you are currently active you will need to do more to find a challenge. Walking is a great exercise for all levels. Choose a distance and terrain that makes breathing a little faster and conversation a little more difficult. High intensity exercise is not necessary, nor recommended, to get most of the health benefits of exercising. An inspiring and fun group at Wednesday morning SilverSneakers® class. Click here to see if you or a loved one is eligible for FREE membership at Damien Roche Fitness Center. Over 12 million people nationwide qualify for FREE gym memberships. We are 1 of 13,000 participating facilities across the country which provide gym membership through some health insurances. If you are eligible, you can probably also find a location near your vacation destinations or seasonal homes. What other exercises can I do? Should I call my Doctor ? Exercise and the elderly myths explained. Download a free Tabata Timer like Gymboss to do this workout without having to waste time checking a clock. Perform each exercise for 20 seconds as intense as you can make it. Take a 10 second break. Repeat for 8 rounds. Use this workout as a marker of your current fitness by recording your totals for each of the rounds. Keep your results and try to beat them in 6 weeks. Here's a fast workout for you to try at home. It's can also be used as a measure of your fitness. Repeat it to beat it as your fitness increases. Go through all these exercises as listed and repeat the whole set as often as possible in ten minutes. As always, warm up well and stretch afterwards. modify exercises as needed. ( let is know below in the comments if you did so others can get ideas of what substitutions to make.) Listen to your body and have fun. Let us kow how you do. If you want to do more than this, take a small rest and continue with this next phase. Pair up the following exercises and repeat the pairs before moving to the next pair. Try 30 sec or 40 sec each exercise. Take no break between pairs. Take 15 sec break between repeats of the set. Take a longer break before starting the next superset pair. Repeat each pair twice or 3 times before moving on to next pair. Let us know how you do in the comments below . Let's not allow this weather to get in the way of our training. Here is a body weight workout that you can do anywhere. Phase 1 follows Tabata format (20:10) This means 20 seconds as intense as you can make it, followed by 10 seconds of active rest. Repeat this 8 times, making it 4 minutes of rounds. Take 1 minute for active recovery before beginning the next exercise. Hydrate as you go and make sure you warm up using lighter versions of the moves you will be doing in these exercises. Use dynamic stretching to further protect you from injury. Phase 1 will take 20 mins. Modify any exercise you need to, add more rest time between exercises if you need to. Challenge yourself but you know your body and so push back but respect it's limits. Record your reps each round and try to beat them. Record the numbers so in a month you can destroy today's scores. Phase 2 is for anyone who is now into it and want to keep going. Take a minimal break after the Tabata and get started on Phase 2 as soon as you can. Cool down and stretch once you are finished. Having a healthy prepared snack ready to go for when you are finished will speed up muscle recovery times. I DONT HAVE TIME TO TRAIN!! ... What's your excuse not to exercise? We all have "reasons" why we can't go to the gym or train. Yet there are busier people than us with less free time that never miss it and feel all the better for it. In fact they may even be more productive throughout the day because of it. So let's break down the biggest excuses and see how we can tackle them, starting with the one I hear the most from clients. Try different times of the day to see what works best for you and your schedule. This may vary from day to day or even from week to week but play around and when it works plan to do it again the next time your schedule is similar. Just do a little at a time, aiming for at least 60 minutes by the end of the day. Even 3 x 12 mins of moderate activity has been found to give positive results, and even if you don't get that full hour you will be lapping the you that isn't doing anything at all. See if you there is something you can cut out in order to make the time for physical activity. TV may be the obvious choice but just by putting electronics away for an hour can make you so much more productive and less distracted. This may be enough to clear up time during the rest of the day for a quick workout. Combine other aspects of your day with exercise. Instead if meeting you friend for a sit down coffee, meet them for a hike or even take the coffee to go and stroll while catching up. Bottom line, it is all about panning and identifying just how important the results you are seeking are to you. If your WHY is important enough you will make it happen. It does not need to be a long workout to have an effect. You can achieve a lot in 20 mins. There's a lot more solutions available too but let us know how you deal with the perceived lack of Time issue? Share with us your tips. Let us know if you think you have a barrier that isn't easily worked around. We will look at your comments and address them and also look at other common perceived barriers in a later blog. Today is the last time the forearm plank will be tested to the max. Perfect form is more important than time. This is as much a mental challenge as it is a physical one. Check back on your previous best, add some time to it and hold on to that number as it gets tough. The difficulty can often come in waves and if you hold on or change your mindset it can get easier for a length of time. Also when you have an impressive time to attack it can be daunting from the start. Don't allow this convince you to quit early. 28 days in and you haven't quit yet so just hold on as long as you can. And then a little longer. Following Day 16's directions, aim to keep the movements slow and deliberate both up and down and on both sides. If the basics are easier, today we are going to aim for rounds of 40 seconds. Hold form for full time or break earlier. 3 x 40 sec rounds, rest as needed between. 3 x 40 sec rounds, rest 20 sec between. 3 x 40 sec Plank jacks followed immediately with 40 sec jogging on the spot, followed by 20 sec rest between.